Sine started general yoga classes about 21 years ago and continued to attend classes in London occasionally or when she was stressed. After a year of ‘playing’ with the idea of yoga she was introduced to Iyengar yoga and never looked back. She attended Glenys Shephard’s classes in the Iyengar Yoga Institute of South London. She felt that practising Iyengar yoga improved her concentration and calmed her mind. She was intrinsically drawn to the idea of ‘uniting body & mind’. She felt that Iyengar yoga gave her the opportunity to experience this unique feeling from time to time! B.K.S. Iyengar says ‘the first 12 years you are a beginner’ and this humbling idea captivated her and she decided to become an Iyengar teacher when she was traveling (and dancing tango!) in Buenos Aires approximately 10 years after she started Iyengar yoga. She believes that the hard-core training of Iyengar yoga and the process of becoming a teacher taught her to be humble, accepting and also made her more flexible. She recently completed her 2-year study of Ayurvedic philosophy and medicine at the European Institute of Vedic Studies. She studied with Sheila Haswell to train as a teacher and attended intermediate Iyengar Yoga classes with Sophie Carrington regularly. Sine believes yoga practice is a must for everyone regardless of age, gender and level of flexibility. Come to classes with an open mind and heart and let yourself into this amazing journey. Sine is a member of the Iyengar Yoga Association UK and holds an Intermediate Junior 3 certification. 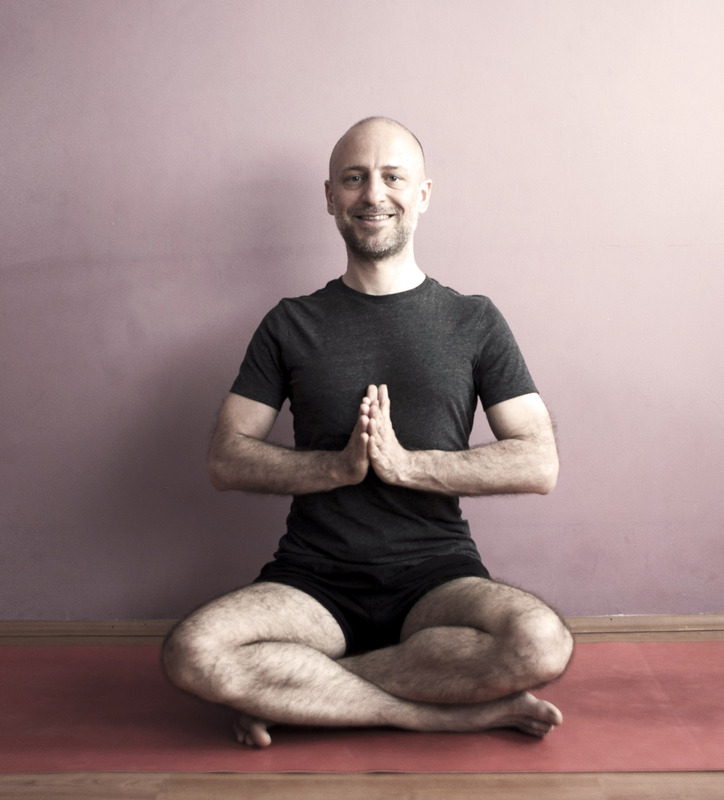 Aidan started attending Iyengar yoga classes in London in 1997 and was instantly drawn to it. It helped to give him freedom from a long-standing back problem and he also enjoyed the calming effects on the mind that yoga practice brings. He completed the Iyengar two-year introductory teacher-training programme in 2006, his Junior Intermediate level 1 assessment in March 2012 and his Junior 2 in March 2015. Aidan has been lucky enough to study over long periods with some very experienced teachers in the UK including Glenys Shephard’s, Sophie Carrington, Ros Bell and Sheila Haswell. He also attended a five day convention with revered Indian teacher Jawahar Banghera and continues to study with teachers visiting Heliotrope Yoga Holidays. Aidan hopes to share the benefits of yoga with those he teaches. He believes that yoga can help everyone to realise their potential and live more balanced and fulfilled lives. His experience is that practicing yoga is a profound way of learning to rise to the challenges of your body and to the stresses of life. The Iyengar method provides the tools for all to benefit from yoga, and Aidan believes that yoga should be accessible to all. Aidan moved to Istanbul in 2009 where he taught regular classes at Yogasala in Etiler for several years. He continues his other work as a musician/producer and also as a director of Heliotrope Yoga Holidays. Aidan is a member of the Iyengar Yoga Association UK. Ced was born in Istanbul in 1978. He did not show interest in his own body until the age of 30. However, yoga was a hidden idea in the corners of his mind during and after his childhood. At home, there was a photograph that always attracted his attention. It was a photograph of a yogini neighbour from Haiti in rajakapotasana, taken during his mother’s student years in Paris. A single black-and-white photograph led him to yoga after many years. He started practicing yoga in 2011 and since then it has been an essential part of his life. In the first two years, he tried and explored different styles and schools of yoga. However, one of them increasingly appealed to him over time and he continued rest of his yoga journey with Iyengar Yoga. He was attracted to how in Iyengar Yoga each asana was studied individually in great detail and adapted for people at different ages and with different body-types with the help of props. After studying regularly with Sine Özsoy and Aidan Love for three years in Istanbul, he studied with Sheila Haswell for another three years at a teachers training course. He became an Introductory Level (INTRO1-2) Iyengar Yoga Teacher in August 2017. Ced thinks that he is just at the beginning of his journey in Iyengar Yoga. This is why he has personally invested in improving his yoga practice. Ced has studied with some other great teachers abroad including the most respected Geeta Iyengar, and Abhijata Sridhar Iyengar, Manouso Manos, Stéphane Lalo, Olga Zvanstova, Marios Argiros, Eyal Shifroni and Aubrey Maasdrop. Pınar started Iyengar Yoga with Kate Atak in 2010. From the very first day she was introduced to Iyengar method she is a proud dedicated Iyengar yoga student. She loves the way of practising asanas, exploring new things through learning process. In 2013 she started to attend the classes of Sine Ozsoy and Aidan Love in Yogatime. While she was enjoying being a student, she and some of her dedicated friends were offered to attend Iyengar Yoga Teacher Training. This opportunity was specially given to the students in Turkey by Guruji B.K.S Iyengar himself (R.I.P) before he passed away. By realizing the importance of this great opportunity she instantly accepted the offer and started training sessions with the one and only teacher Sheila Haswell. As of 17.09.2017 Pinar is a certified Iyengar Yoga teacher for Introductory Level 1 and 2. She is one of the first native Iyengar teachers of Turkey. She is now ready to share her knowledge with those who would like to practise Iyengar Yoga in Istanbul. Always being amazed by miracles of yoga she is also very excited to see what will be the next step in her journey. I started practicing yoga in 2007 while doing my PhD, to find a cure for my ongoing problem of fatigue and muscle pains. From then on, Iyengar yoga has become an important and enjoying part of my life for maintaining my health and increasing my concentration level. For three years, I was a regular student of Paul Cabanis. After moving back to Turkey, I started practicing Iyengar yoga, primarily with Aidan Love. In 2014 I started my teacher training under the guidance of Senior Iyengar Yoga Teacher Sheila Haswell. After about 3 years of training, I took my certificate of Iyengar Yoga teacher, at the Introductory I-II level. In my classes, I like to express the features of yoga that separate it from other forms of physical activities, including concentration, softness, details of actions in the asanas. I try to preserve my sense of humor while deepening the practice by staying in the asanas for longer durations. Hi, I moved to Istanbul a year ago from Washington DC and looking for a good Iyengar yoga class. Could you please let me know where exactly you are located and if you have classes near Levent? Hi Manjula, We are located in Kuzguncuk, which is on the Anatolian side near Uskudar. If you are interested in attending please call Aidan on 0534 979 3856. Currently we do not have classes in or around Levent. However Aidan teaches in YogaSala in Etiler (www.yogasala.com) which is nearer to Levent. 1 ay önce Bern’de Jawahar Bangera’in verdigi iki günlük kursa katilmistim. Hayran oldum. Iki gün sonra sanki ucarak Basel’e döndüm. Selam Zeynep, duygularini cok iyi anliyorum. Ben 4 gun Jawahar ile calistiktan sonra galiba he ona asik olmustum hemde ucuyordum!